A 26-gun 6th-rate frigate of the Spartan Class. The third Royal Navy vessel to carry the name. 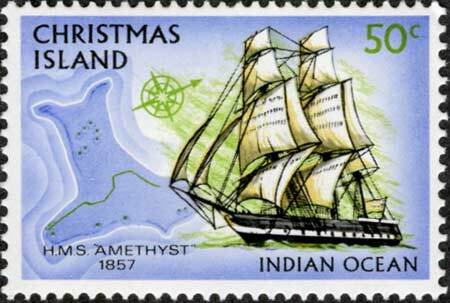 Launched 7 December 1844 and commissioned July 1856 under the command of Captain Sidney Grenfell. Saw action mainly in the Far East. Laid up at Chatham at the end of 1860. Loaned with HMS Iris to the Atlantic Telegraph Company in 1864, and its successor, The Telegraph Construction & Maintenance Company (Telcon), in 1866 and 1868. Sold to Telcon on 16 October 1869. 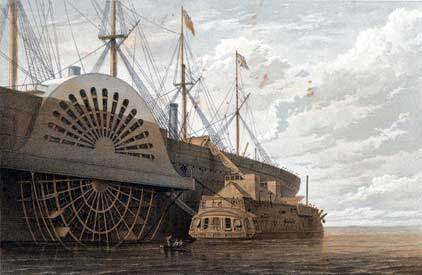 On all three occasions, both ships were used as hulks to transport cable between the company’s Greenwich works and the Great Eastern at Sheerness. A 26-gun 6th-rate frigate of the Spartan Class. Laid down September 1838, launched 14 July 1840 and completed at Chatham Dockyard 11 January 1841. Commissioned 20 August 1841 and saw action in the Far East. Along with HMS Amethyst loaned to Telcon in 1864, 1866 and 1868, and sold to the company on 16 October 1869. The Lords of the Admiralty granted the loan of two sailing ships which had been “laid up in ordinary” (i.e. mothballed) at Chatham, HMS Amethyst and HMS Iris. These ships had to undergo considerable alterations to render them suitable for the work, portions of the main deck being removed fore and aft to make room for watertight tanks to hold the cable. “Pembroke Dockyard and the Old Navy” by Lt. Cdr. Lawrie Phillips.